In 1891, early on in her career, German author Anna Croissant-Rust (1860-1943) published a number of remarkable short works. Blending prose and poetry, disregarding taboos, she was pushing at the edges of the permissible in both style and subject matter. In August she pushed right through, with a contribution to Moderne Blätter, the journal of the Munich-based ‘Society for Modern Living’ of which Croissant-Rust was the sole female member. ‘Wedding’ was a vivid insight into sexual anxiety in which a marriage ceremony is rendered as something akin to a ritual sacrifice. Croissant-Rust describes a young bride exposed to the leering gaze of the wedding party, her fear of imminent deflowering projected into imagined dialogue. Here we find the hallmarks of the writer’s most audacious work that would culminate in Prose Poems (1893) and reappear in Death on the eve of the First World War – lights, colours, flowers, the agency attributed to inanimate objects, instants distilled to their emotional essence through a filter of acute psychological perception. But the intimations of sexuality were too much for the authorities, who confiscated the edition of Moderne Blätter in which it appeared. As the author herself related, it was given to three trainee lawyers to read, who were then asked if the story had aroused them; when they replied in the negative the issue was cleared for sale once more. It was at least a marketable episode, and as the issue returned to newsstands it bore a banner announcing the confiscation. With its fearless avant-garde style and pre-Freudian insights, ‘Wedding’ confirms Anna Croissant-Rust as a vital yet undervalued exponent of early Modernist literature. The bride’s coupé stops at the church door, the long, stark row of black coaches forms a dark line on the sunny, whitish street. A tingling curiosity passes through the crowd. It orbits above their heads, a fever in their hands and feet and a gawking in their eyes; softly, softly it steals through the silk upholstery of the coach and creeps into the matt white bridal bouquet with its sweet, sensual aroma of Malmaison roses, myrtle and orange blossom. She is overcome by quaking, she recoils in apprehension and fear of the yellow-reddish brute gaze that lurks there. The coupé door is now wide open, the church steps dazzling in the sunshine, boastful in their ingratiating covering, crimson, soft, submissive, while solemn plants peer expectantly from the dark church door, tall and green, with light flickering over the earnest admonishment in their leafy twigs. The stiff satin of the bridal train rustles busily and waves over the coupé footstep, billows haughtily over the supplicant runners and moves inside the church, grave and worthy. White satin, white tulle surges soft and shy around maiden cheeks drained of colour, sultry scent of roses brazenly dominating the orange blossoms, while the myrtle remains stiff and incorporeal. The stiff white myrtle wreath is set firmly in her hair. A shudder runs through the young bride. She sees the reddish-yellow brute gaze lurking all about, squatting in the church pews, grinning from the side aisles, nodding from the alcoves, waiting at the altar. Are they all looking at her? All of them? She beckons and steps forward, her right hand an obliging, inviting gesture directed at her child. She smiles sweetly. ‘Please, I insist, come closer everyone, you all know that today, today is the day, you know, you know the day when one wears white satin and myrtle because … well’ – and here she giggles, and now thick tears are running down her face, but again she laughs – ‘closer, please, look at my daughter the virgin for the first, second, third and last time. This very day she will give herself to her husband. In due form, with all due honour – a good match. But tactfully, not straight after their wedding; a banquet, a honeymoon, the first stop is in …’ her voice drops to a murmur, she retreats to her misty circle. ‘Money! So much money it cost,’ her father puffs behind her, wiping the sweat from his brow and twirling his top-hat in his hands, ‘but she has my blessing, it’s all fine and above board,’ and then he leers at her, leers at her friends. The young bride looks at the floor, she shivers, her hands clutching the flowers, maliciously rises the sweet and sultry scent of the orange blossoms. Next to her, touching her, a black tailcoat of the most elegant cut. The dull sparkle of silk lining, patent leather shoes tittering pretentiously, a stiff collar, white, dazzling and haughty, wreathed by a white tie. The wax head with its stiffened moustache and singed hair smiles with unceasing vapidity beside her. The yellowish-reddish gaze steals over him to her, this spark – can he not see it? The young bride is shaken by quivering. Like cold, slimy mud it runs down her body, soiling, staining, defiling. Are the flowers not wilting in her hand? Is the wreath not falling from her hair, are the lights not going out? Is it not getting darker, darker? But from out of the darkness comes bright, weaving sunshine. Breeze-ruffled flowers, swaying green leaves. And a sunny, surging joy in her heart, calling hot and shy. Another’s hand holds hers with the strength and joy of youth, two eyes shine, shine, call to her. Flames ignite in her heart, shy, shivering little flames, flaring, flickering, increasing in constant ardour. Two arms hold her tight, sheath upon sheath falls from her body, in chaste purity her body shines, inundated with hot sun. Soft, hesitant sounds of joy in her ear, resounding, exulting cries, she feels herself being carried away, bedded, engulfed – alone, alone! The sound of the organ, women’s voices, a circlet presses her finger, skipping gleams of light, arms that press her, moist, fat, sucking lips meeting hers, a flaccid mouth pressing against hers, kisses, kisses … yellowish, reddish flashing gaze, the beast, the beast! Her train rustles over the flagstones once more, the weary, mocking scent of flowers all around, mist, unsteady grimaces all about, a hand supports her and the silk upholstery creaks reluctantly under its dual burden. ‘Wedding’ by Anna Croissant-Rust was first published in German as ‘Hochzeitsfest’ in Moderne Blätter, no. 22 (29 August 1891). First book publication in Lebensstücke: Ein Novellen- und Skizzenbuch, Dr. E. Albert & Co. in Munich, 1893. Death by Anna Croissant-Rust (incl. Prose Poems), tr. James J. Conway, is available through Rixdorf Editions. As well as using old postcards in our artwork, we have recently started using postcards to make... postcards. Specifically, a series of art cards offering variations on original motifs of German postcards from around the beginning of the 20th century. Well, one of our central aims with the whole Rixdorf Editions project is to introduce a combination of time and place largely unfamiliar in the English speaking world (Wilhelmine Germany) and show how it was actually a crucible for progressive thought that exerted an unacknowledged influence on later eras from the Weimar Republic to the present day. Taking original imagery from the time and cropping, blowing up and amplifying the colour symbolises this process by liberating the latent Modernism of the age. There are the dots seen in close up which foretell everything from Pointillism to Pop Art. There are the mismatched colour registrations and their evocative suggestion of new and dynamic graphic realms. And even when (actually especially when) catering to mass market tastes, there are surreal juxtapositions of imagery. 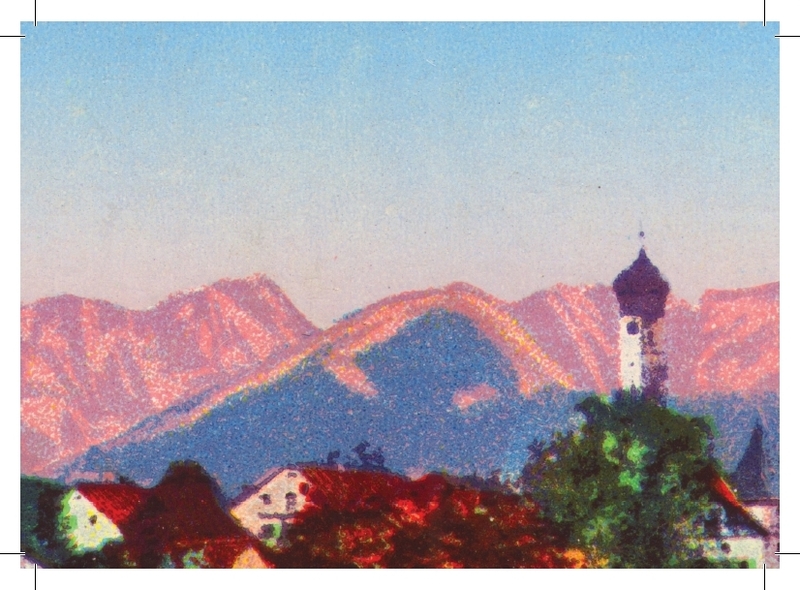 The first series of eight cards is called 'Landscape', referring to both the format and the subject matter, with the source material depicting scenic splendour throughout Germany from Heligoland to the Bavarian Alps. Some of the original cards were photographs, some illustrations, some a strange amalgam of the two. Anyway, it's just an experiment for now. We'll be including a selection of postcards with each online order until we run out.